Turn off the Noise. Turn on the Focus. Social media is a part of our lives whether we like it or not. It can be life changing. It’s a way to bring old friends together and allows you to share your world or craft like never before. It can even get you a gig and transform what you do for a living. The only thing is (like everything in life) it needs to be accessed in moderation. It’s easy to get caught and go down a rabbit hole. You’re scrolling through your favorite designer’s 3D creations and then look up at the clock and suddenly the entire day is gone. Sometimes the best thing to do is simply to turn off the noise. We’ve all been there. It’s late in the afternoon, you’ve decided to sit down and hammer down on a project. You stare at the screen for a couple of seconds and then think to yourself, “I better check my email…just in case.” A little distraction like this can turn into 30 or more minutes of checking other things…focusing on smaller, insignificant, easier tasks. Finally, you get back to your bigger project and you’re feeling even less inspired and productive than before. Why? You just wasted energy and focus tackling the small stuff, the stuff that can wait. It’s empowering to say “no” to the noise. When suffering from a burn-out or block, working in the dark can actually be illuminating. When we’re distracted, our creativity slows and we lose determination. It becomes more difficult to problem solve and work through challenges without getting bogged down and fatigued. All the crazy amounts of information might feel stimulating, but it actually puts stress on your system with information overload. There is only so much attention one can put into focus. Working in the dark away from constant distractions allows us to work more productively and freely. 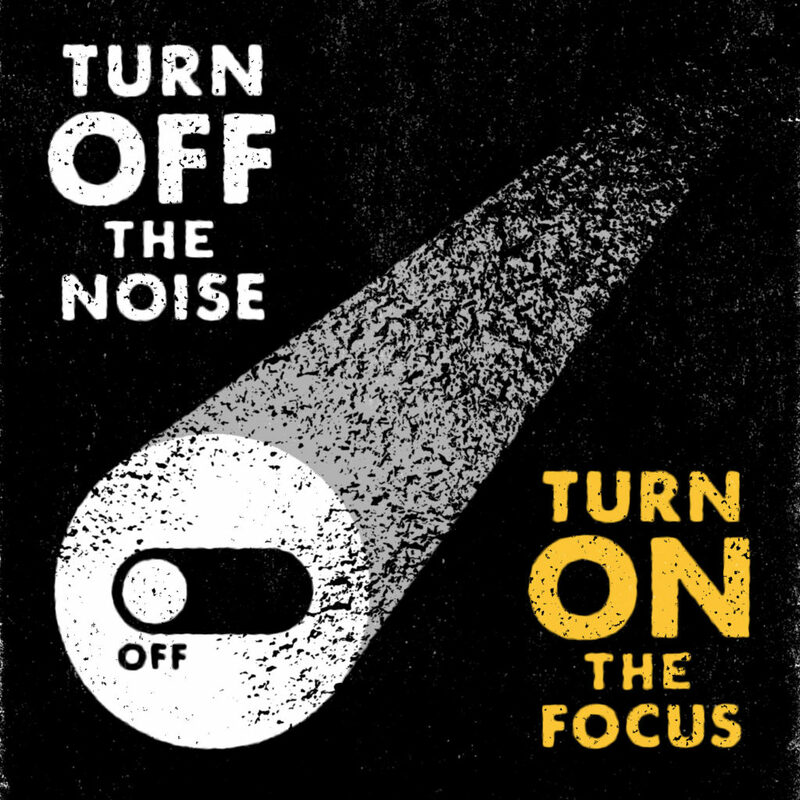 Excess noise can cause unwanted anxieties to spring up and pull us away from a creative thought and positive, productive workflow. The best way to use your creativity is to knock out the heavy thinking in the morning. Save all the no energy stuff for the end of the day. Sure, check your emails and get to the most important ones, but the ones that can wait… make it wait. Don’t waste your precious creative energy on something that you can get to later and that gets you out of the creative flow. It is so much harder to get back into it and you get more done if you put your big projects for that day up front. A recent book I read by Jonah Lehrer titled “Imagine: How Creativity Works” states that every time you are interrupted it takes about 20 – 30 minutes to get back in the groove that you got knocked out of. That adds up fast! Someone likes your FB post. Distraction. Ping that someone looked at your LinkedIn profile. Distraction. Email that storage bins are on sell. Oh my… Distraction! I check all avenues in the morning, lunch and then again in the evenings. Then, I go through as fast as I can. I’ll try to get back only to the ones that are important. The others can wait until the evening when I am in low energy mode. -Set strict rules for yourself. Block out a chunk of time to focus on ONE task. Set an alarm. Do not do anything else until that alarm goes off or when it is done or you need a break. If you have clients, it’s important to establish boundaries. If you find yourself replying to an email as soon as you receive one, you’ll never get anything done. Once you’ve found a system that works for you, be transparent with your clients. Let them know when you’re available and when you’re not! Of course there are always exceptions to the rules. If I have a tight deadline that requires me to be in constant contact with my client then yeah… I put the email on and respond as fast as the information comes in. Once the red buzzer goes off and all is calm I go back to my usual routine of total blackout. It can be nerve racking at first. What if I miss something. Will an opportunity go by? Will someone get pissed if I do not respond in 2-3 seconds once it hits my in mail? All tall tales we make up in our heads. IF someone REALLY needs to get a hold of you they will. It all comes down to communication and how you control it… instead of letting it control you. Fight the noise!